Created and coordinated by Thierry Fournier (artist, curator and researcher) and J. Emil Sennewald (art critic, journalist, lecturer and researcher), the research group EnsadLab Displays is part of EnsadLab / PSL, research laboratory of the EnsAD / Ecole nationale supérieure des Arts Décoratifs (Paris, France). Displays aims to question and experiment the contemporary exhibition forms and stakes in a context pervaded by digital cultures and practices. It is the first doctoral research-creation program in France dedicated to the exhibition, in a “research through exhibition” and experimental approach. This evolution has already transformed artworks, collaboration modes, curatorial practices, art criticism, art education and outreach, audiences, and how they look at art. It also entails an acknowledgment of digital materiality and of its processes, after a historical period marked by an ideology of dematerialization. Furthermore, a certain porosity has set in between practices – for example, between those of artists, curators and audiences, in the case of curation – a practice that involves reinterpretation and exchanges, which attests to the conversational status of media. Our research takes all of these issues into account, and addresses the way in which they modify the thinking behind, and the practice of, exhibitions, as far as the different actors’ roles are concerned, but also with regards to the objects involved and the spaces and networks these exhibitions invest. Our approach consists in a research through the exhibition, which is treated as an experimental situation that involves a set of actors, objects, production and valorisation modes, spaces and temporalities. The exhibition is seen here as a moment within a process, rather than as the result of one, and is considered “experimentable” and debatable by the different stakeholders (artists, audiences, art and museum curators, critics…), in view of a critical approach of their interactions. 1. What. How do an exhibition’s objects evolve, from exhibited objects and works of art towards gestures, performative situations, experimentations and production processes? How do e-publications (which are themselves evolving processes, no longer merely publications) and mobile environments contribute to new curatorial forms? How are questions related to reproducibility and simulation brought up? Can experiences of co-creation conducted in a museum setting also apply to art exhibitions? 2. Who. How do relations with audiences evolve, and who designs exhibitions? How do viewer expectations and practices evolve? How does the distribution (or reclaiming) of roles among artists, curators, critics, exhibition planners and designers develop? How can these be related to the context of institutional critique? How can we experiment with audiences? What part does interactivity take today in curatorial forms? What are the stakes involved? What are the goals and stakes of participation, particularly of social networks in museums and exhibitions? 3. Where. How are exhibition spaces and venues evolving? Now that audiences are largely accessing art and culture online, what bearing does this have on the distinctiveness of the exhibition experience? What shapes are exhibitions taking in a dialogue between real space and the network? 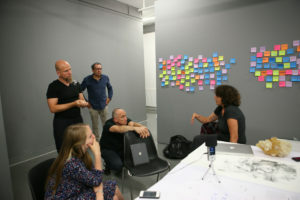 How can the collective space of the exhibition be connected to the individual practice that is unique to the web and mobile devices? How can we put forward a critique and create the conditions for emancipation from the rationale of the attention economy? How can we qualify and critique relations between museums, online exhibitions and data bases?